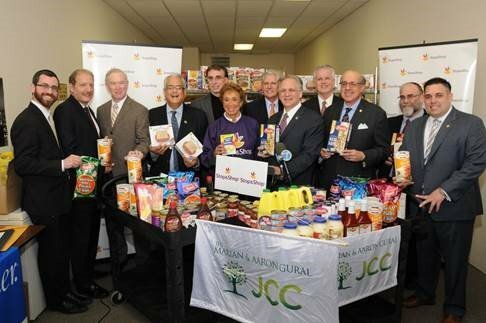 Nassau County Executive Edward P. Mangano has announced announce a one-ton donation of Kosher for Passover food donated to the Rina Shkolnik Kosher Food Pantry. Hempstead, NY - April 12th, 2016 - Nassau County Executive Edward P. Mangano joined with Town of Hempstead Supervisor Anthony Santino, Town of Hempstead Councilmembers Bruce Blakeman and Anthony D’Esposito, and several Rabbis from the Five Towns community, on Thursday, April 7th, to announce an emergency one-ton donation of Kosher for Passover food donated by Stop & Shop to the Rina Shkolnik Kosher Food Pantry. “On behalf of the community, I thank Stop & Shop for its generosity. This contribution will allow families in need to properly celebrate the Passover holiday,” said County Executive Mangano. The one-ton donation from Stop & Shop included: Matzah, Matzah meal, canned vegetables, canned salmon and canned tuna, gefilte fish, egg noodles, grape juice, apple juice, boxed mixes of potate kugle, boxed mixes of cakes, packaged soup mixes and apple sauce. Established in 2005, the Shkolnik Kosher Food Pantry is the largest Kosher Food Pantry on Long Island. It began by helping 35 families, and now works with nearly 300 families from the Five Towns and neighboring communities in Nassau and Queens. The pantry is a joint initiative of The Marion & Aaron Gural JCC and UJA-Federation of New York, and is supported by the Five Towns Community Chest, the Inwood Charities Fund, Long Island Cares and Long Island Harvest. Subject: LongIsland.com - Your Name sent you Article details of "Mangano Joins Stop & Shop In Donating One Ton Of Kosher For Passover Food To Pantry"